contain ethical, philosophical, & devotional material. The story of Ramayana portrays ideal characters, such as ideal father, servant, wife, and king, and tells the story of Rama, the incarnate of Vishnu as a human being, destined to battle a fearsome demon called ‘Ravana’. Rama’s father is a king, and one day, Rama would be his father’s successor, but Rama’s mother opposed this notion, and instead put Rama to exile, accompanied by Rama’s wife, Sita, and one of 4 of his brothers, Lakshmana. Before the end of his exile, Sita was captured by Ravana to Lanka City (present-day Sri Lanka). Therefore, the brothers & the Monkey Lord ‘Hanuman’ went on a pursuit to retrieve Sita & defeat Ravana. 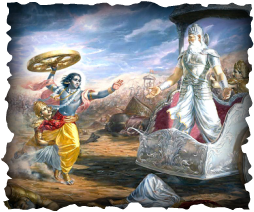 The story of Mahabharata depicts the world as a now corrupt and unstable world. The epic portrays a group of heroes and a group of villains that come from the same bloodline. The heroes are the 5 sons of Pandu (Pandavas), while Pandu’s brother’s sons (Kauravas) are the enemies. The cousins fight to death in the extremely brutal and cruel “Battle of Kurukshetra”, causing the whole race to nearly get eliminated by this act of violence. Although the heroes won, they also died from the savagery, and the world became corrupt until the present time. Only Krishna, one of the Pandavas brothers that symbolized positive attitude, stayed alive. In conclusion, the morals of these two epics are valued within the Indonesian Hinduism, effectively used for teaching practical and rational ethics to the younger generation about ideal characters, positive attitudes, hindering sin, preventing greed, the value of honesty, of dedication, of duty, of sacrifice, using good against evil, finding peace, maintaining purity, respect for one another, and the importance of unity in the family. FUN FACT Garuda, a Hindu mythological bird, is used as the National Emblem of modern Indonesia.